Most of us don't need it, for games or other work, but damn is it fast! The fastest SSD we've ever tested, and 3D XPoint gives a look at where storage is headed in the coming years. Originally slated to come out last year, Intel's 3D XPoint technology encountered more than a few delays. That's not too surprising for a radically new technology, but I admit to being worried that when it finally arrived, 3D XPoint would underwhelm. Earlier this year, Intel launched the enterprise Optane P4800X drives, priced at $1500 for 375GB, and today 3D XPoint comes to consumer SSDs with the Optane SSD 900P family of drives. Could the drives possibly live up to the hype? In 2015 Intel said 3D XPoint (pronounced "cross point") would deliver up to 1000 times the performance, 1000 times the speed, and 10 times the capacity of traditional NAND. Those are obviously numbers that won't be achieved on the first version of the drives, especially since the interface is limited to x4 PCIe (about 4GB/s), which NAND SSDs have already come close to saturating. But what about the rest of the claims? Endurance is the easy and most striking example of the improvements 3D XPoint brings to the table. The Optane 900 SSDs are rated at 10 DWPD, or drive writes per day, for five years. Let me put that in perspective. Samsung's 960 Pro line is rated at 400 TBW (terabytes written) for the 512GB model, over five years. That means you could potentially write about 220GB per day, every day, for five years before the NAND gets used up. That's a whole lot of data, as power users average closer to 10-20GB per day of writes, and casual users may only do 1-2GB per day or less. The Optane SSD 900P can do 10 DWPD for five years, or 2800GB per day on the 280GB drive, every day, for five years. That works out to 5.11PB of data (1PB = 1000TB = 1 million GB). That's nuts, though the mathematician in me must point out that 5.1PB, while impressive, is nowhere near 1000 times the endurance—that would be closer to 300PB. I'm jus' sayin'…. As for capacity, or at least density, it's early days for 3D XPoint. Current packaging puts 16GB per chip, which isn't particularly large. Maybe in the future we'll have M.2 SSDs using 3D XPoint that are 10TB in size, but that day is not today. The largest 3D XPoint SSD is currently the new 480GB 900P model, and while Intel talked about plans for 750GB and 1.5TB Optane P4800X earlier this year, those have yet to materialize. The lack of benefit from the additional 3D XPoint dies suggests the controller and/or interface might be the limiting factor. It also makes me wonder if we'll see Optane drives with a faster x8 or x16 interface in the future. Intel has talked about server DIMMs that use 3D XPoint as well, which would blow the interface bottleneck wide open, but for now we're dealing with a less extreme product. That doesn't mean the performance can't impress. I've used my standard collection of storage benchmarks to test the 900P, but it warrants pointing out that some of these are synthetic and won't really hit the areas where the SSD excels. Intel is pushing the high performance at low queue depths heavily, and with good reason. Most users won't go much beyond a queue depth of four in normal use, and the majority of storage reads/writes happen at QD1. But to show how much faster SSDs can be compared to HDDs, testing at QD32 is pretty common. Outside of heavily loaded servers, such workloads are fantasy land. It's in the real world that performance matters, but in the real world most users aren't running heavy storage workloads—just about any SSD would be fine. So we're stuck in a bit of a conundrum. Optane is great for real-world use at QD1-4, and real-world users mostly don't need more storage performance than a basic SSD. But for those that do need more speed, the 900P has that and more. Swipe left/right for more benchmarks. Overall performance is immediately and noticeably higher than any other drive—the Optane 900p beats the former champion 960 Pro by nearly 30 percent. That's a major jump in performance, and the individual results show where some of the largest gains are to be had. The IOMeter mixed read/write testing (where the SSDs simultaneously read and write data) and PCMark 8 Storage Bandwidth show substantial improvements, but the real winner is the CrystalDiskMark QD1 random read performance, where the 900P is over six times faster than its nearest competitor. At QD64, the drive merely looks average, but that's mostly a theoretical data point—if any system is every reading/writing data at QD64, there are usually other problems to address. The file copy test shows a small gain, CDM sequential write is also up, but other disciplines have the 900P trailing other SSDs. Does this mean the drive isn't always the fastest? Yes, in a few cases, but in practice most of the areas where it trails aren't critical, and performance is nearly at the top of the stack. Sequential read speed is the biggest shortcoming, but at 2.7GB/s few applications will ever exceed that value. If I give equal weight to all the areas of performance, the Optane 900P ends up dominating its closest competitors. But there are downsides to all this performance. First, there's the price. $389 for 280GB is a good value… if we're living in 2012. These days, even with the inflated pricing of SSDs due to NAND shortages, the best prices for SSDs tend to be around $0.25-$0.30 per GB. Optane 900P takes things back above $1 per GB, landing at $1.39 per GB, over twice the cost per GB compared to even the Samsung 960 Pro. Intel has teamed up with Roberts Space Industries (RSI) to offer an exclusive ship for Star Citizen to early adopters, the Sabre Raven. That partially offsets the sticker shock, but it's a limited time offering. There's also a $15 upgrade to Squadron 42 available if you buy the 900P. The other potential drawback is that Optane 900P is basically for desktops only, given the U.2 and PCIe AIC form factors, and power use under load can be pretty significant at 5W idle—not the sort of thing you'd want in a laptop, then. Hopefully future revisions can make it suitable for laptops, because the computing world is becoming increasingly mobile. 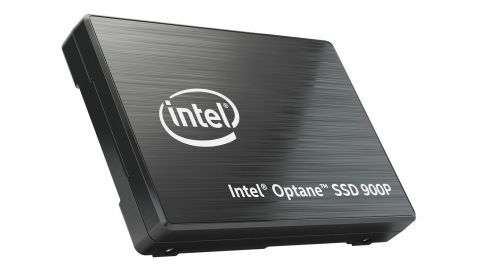 Given the extreme performance and cutting-edge technology, Intel's Optane SSD 900P easily warrants an editor's choice award. But I have to qualify that slightly, because there aren't many people that really need this level of performance in a desktop PC—myself included. If you're mostly concerned with surfing the Internet, playing games, watching movies, and similar mundane tasks, you can get a substantially larger SSD and you'll rarely if ever notice the lack of performance... until you have to do some creative file management, or verify a large Steam download. The Optane SSD 900P earns high marks, and I'm excited to see what the future holds, but unless you're a storage speed junkie, you shouldn't feel compelled to buy one. But if you lust after the hottest computer hardware? Yeah, it's drool worthy.